The eyes of 62-year-old Tom Roe were nearly closed as he sat in the living room of his Summerlin home. He appeared to be close to nodding off, even though he was sharing an account of an extraordinary experience: A virtual stranger had offered to donate a kidney to him so he could get another chance at a full life. "When you're on dialysis, you're so weak," he sighed late Tuesday morning, apologizing for a lack of energy that left him speaking in a monotone. "I hope this all works out." So does 54-year-old Randy Warner, who has offered a kidney to Roe, a man he has met in person only once. Medical personnel at the Mayo Clinic in Scottsdale, Ariz., where the transplant would take place, would like it to work out, too. Warner goes into the clinic Sept. 29 for four days of tests to see if his physical and psychological health is good enough to donate a kidney to Roe, whose kidneys failed about two years ago because of unmanageable hypertension. Tests already have shown their blood types match. If all goes well in Warner's exams, the transplant could take place before Christmas. "It's an incredible story that lets people know what it takes to be a living donor," said Lynn Closway, a spokeswoman for the clinic in Scottsdale. "We're following this case very closely." Warner, an animal rights activist and published author, lives with his four dogs in a home in the Arizona desert about 30 miles south of Hoover Dam. Scorpions and rattlesnakes far outnumber people in that part of Mohave County. "I'd really like to show people that it's not that big a deal to save a life, that more people should do it," Warner said recently as he played with his dogs in Sunset Park off Eastern Avenue. Warner, who tries to make ends meet from royalties he says he earned from eight books on the humane treatment of animals, recently made the drive to town to visit with individuals interested in bringing a drum and bugle corps to Las Vegas. His dream of starting what amounts to a marching band on steroids in Southern Nevada was what initially brought Warner and Roe together. Warner had advertised on the Internet in August 2007 seeking musicians and administrators for a startup group. Roe's 27-year-old daughter Katie saw the ad and told her father. Long before Roe moved to Las Vegas in 1979, he was a drummer with a drum and bugle corps in Minneapolis and was sought after around the country as a judge for marching music competitions. "When Tom called and showed an interest, I was really excited," Warner recalled. "Here was this nationally known guy that I could put on my board of directors. He loved drum and bugle corps just like I did. He said he was having some kidney problems, but both his wife and two cousins were perfect blood type matches. He told me he'd be getting a transplant soon at the Mayo Clinic." Warner and Roe continued to communicate by e-mail. That's how Warner found out in March that health problems involving Roe's family members would not allow them to be kidney donors. "I decided it was crazy to just let him get sicker and sicker, so I called Mayo," Warner said. "I had read that people can get by just fine on one kidney. They (Mayo administrators) asked me why I wanted to do it, and I said I wanted someone to live so he could stay involved in what he loved, the drum and bugle corps." Last spring, organ transplant representatives at Mayo, convinced by their communications with Warner that altruism was behind his desire to help Roe, sent him a blood typing kit and urged him to get tested at Kingman Regional Medical Center in Arizona to see if he was a match. He was. Roe said he was stunned when Warner e-mailed him with the news that he wanted to donate a kidney as soon as possible. "I couldn't believe it," he said. "I never even had met him. I didn't ask him to do this." In June, Roe and his wife, Susan, met Warner at a Coco's restaurant on Eastern Avenue. They talked about the drum and bugle corps and how they got to this time and place. "I told him I couldn't bear to be so close to having a great man like him influencing what we could do here and then losing him," Warner said. Susan Roe, a Sunrise Hospital nurse who has been married to Roe for 33 years, admits she was initially wary of Warner. It was hard to understand, she said, why someone would donate an organ to someone who was basically a stranger. She said she's seen a lot of people who are not on the up and up in Las Vegas. "But when I met Randy that day at Coco's, I knew he was for real. He really wants to help my husband. He's a very selfless person with a big heart. It's been said that people who love the drum and bugle corps are like a big family, but this is carrying it to the extreme." That day Warner became more sure than ever that he was doing the right thing. "Here was this guy with such great ideas for percussion, and he fell asleep right next to his wife as we were talking," he said. "It just made no sense to let him die. I wish I could have given him my kidney right then." Roe's diabetes and hypertension had long been watched by his physicians in relation to his kidney function. In 1999, when his son, Christopher, was diagnosed with leukemia, Roe's health took a turn for the worse. "The stress was a large factor," his wife said. Less than a year after he came down with leukemia, Christopher died. "He died on his 16th birthday," Roe said, staring out the window of his home. "I still don't like to talk about it." After 12 years with the Clark County School District as a special education teacher's assistant -- he used percussion instruments in his therapeutic work with kids -- Roe had to leave his job in 2002. His high blood pressure was literally killing his kidneys, making it impossible for him to work. For the last year and a half, his kidney failure has forced him onto dialysis, a tedious half-hour procedure he performs at home four times a day. On dialysis, artificial means are used to filter waste and maintain acid-base balance as well as remove excess fluid from his body. When Roe told Warner how his life had come to revolve around dialysis, Warner said that made it easier to drop 30 pounds and to quit smoking, two steps that doctors at the Mayo Clinic said he had to take in order to become a donor. "They gave me six months to drop the weight, and I did it in two," Warner said. Susan Roe couldn't have been more impressed. "It really showed his commitment to the transplant," she said. If Roe gets his transplant this fall, his wait for a kidney will have been far less than many people have to endure. Four-year waits or more are commonplace, according to Dr. Leslie Spry of the National Kidney Foundation, which found that more than 3,900 kidney patients died in 2006 waiting for a transplant. Just more than 17,000 kidney transplants were done that year. Organ Procurement and Transplantation statistics show that more than 80,000 people are on the waiting list in the United States for a kidney transplant, including 220 Nevadans. Though donations of kidneys have nearly doubled in the last 10 years, the donor population simply isn't keeping up with the need. The most dramatic part of that jump is in donations from living donors, noted Dr. Joseph Vassalotti of the foundation. Over the same time period, living donations more than tripled. Spry said a new type of laproscopic surgery that allows living kidney donors to go home after two days may have had a lot to do with the increase. Spry noted, however, that the transplant procedure still has risks for donors. "It is a major operation," he said, noting that risks from general anesthesia and surgical complications should not be dismissed. If a donor should one day end up with a failing kidney himself, Vassalotti said there is a benefit. "The donor goes to the top of the transplant list," he said. That Warner is willing to take the risk of donating an organ doesn't surprise Barbara Blythe, a Mohave County grants coordinator who helped Warner get a new manufactured home through a grant. "He helps others before he helps himself," she said. 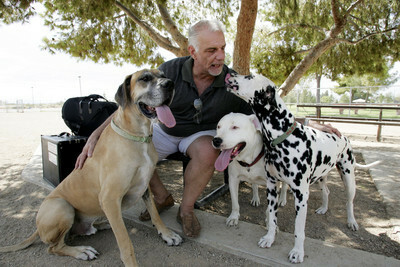 In California he founded Dalmation ResQ, forsaking careers in group sales, computer programming and the hotel business to save some 2,700 Dalmations over a 15-year period, an effort that gained occasional attention of national media outlets. "Somebody had to do it," Warner said. "I just couldn't let all those dogs get killed." While living in California, he also donated part of his liver anonymously through Cedars-Sinai Medical Center after watching a TV show about the need for liver transplants. "When I see a need, I just go by the seat of my pants," he said. "I don't have a lot of money, but I care about living things. I turned out fine so I don't see a problem donating a kidney." Warner left for Arizona about seven years ago, moving into the old trailer that animal rights activists in the West had used for overnight stays. Although Warner feels sure he's going to pass the physical that will allow him to donate his kidney, Roe would like to be more excited about the possible transplant. "I can't tell you how wonderful I feel for what Randy is doing," he said. "I can't thank him enough. But I can't get too high over this. "Remember, my wife and two cousins were perfect matches too, and they couldn't do it. Of course, Randy is Randy and there is no one else like him. So I feel optimistic." Contact reporter Paul Harasim at pharasim@reviewjournal.com or 702-387-2908.